Relax with a cool beverage and tasty snack at Gaston's Tavern. If you’re in Fantasyland and feeling like a snack that’s more substantial than popcorn, head to Gaston’s Tavern. Just look for the shimmering bronze statue depicting Gaston. Inside, you’ll find a cozy yet overtly masculine atmosphere: perfectly themed for Gaston’s favorite hangout. This counter service stop is worth checking out just for the theming alone. Gaston’s mighty chair is a perfect photo-op spot. 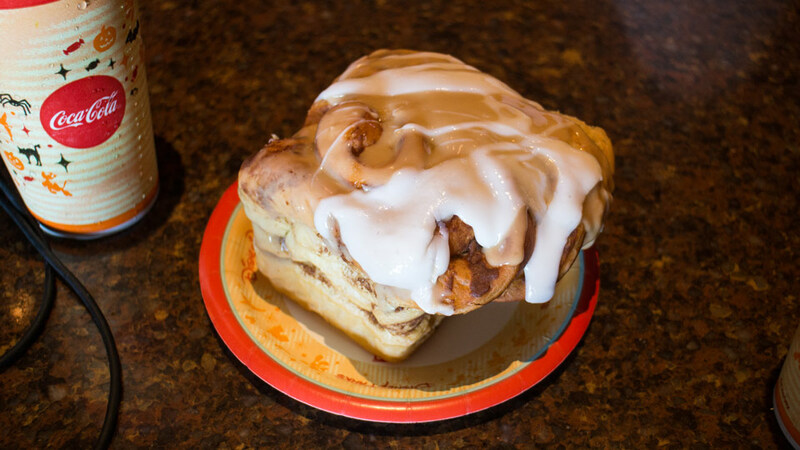 Gaston’s has a snack lineup ranging from healthy Hummus and Chips to not-so-healthy but oh-so-delicious Warm Cinnamon Roll. Looking for a quick meal? Try the Tavern Beef Stew. For warmer days at Disney World, be sure to check out LeFou’s Brew (Disneyland guests will recognize this drink as Red’s Apple Freeze from the Cozy Cone in Cars Land). This frozen apple drink features less calories and fat than a certain boy wizard’s beverage of choice, but it’s also not quite as sweet. Still, LeFou’s Brew is an extremely tasty way to refresh yourself. A new addition is LeFou’s Winter Brrew, which is a hot cocoa with toasted marshmallow and crushed candy cane. Gaston’s used to serve a Roasted Pork Shank, which we were a big fan of, but that has been discontinued. Note: Menus for Disney World restaurants change on a somewhat regular basis, so the menu listed above is subject to change. For the most up to date menu, check out Disney’s official Gaston’s Tavern page.